Barbara in Danville has won a new iPad for using FPF’s “Invite Neighbors” feature as part of our recent push for new members. 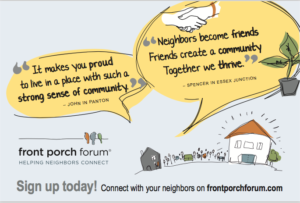 She was randomly selected from those members who successfully invited their friends, family and neighbors to join the conversation on Front Porch Forum over this past week. Congrats to Barbara and thanks to all of our FPF members who participated in our contest.